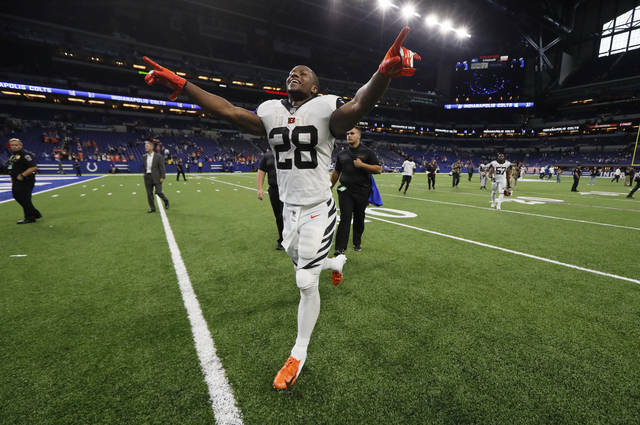 CINCINNATI (AP) — When the Bengals raised the curtain on their new offense, Joe Mixon was front and center. 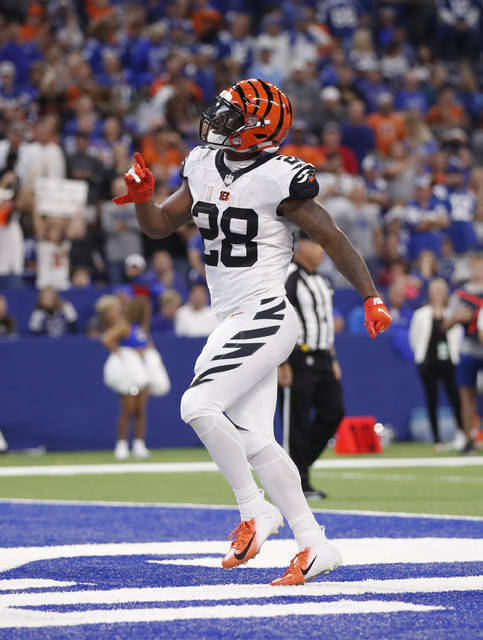 The second-year running back was the focus of Cincinnati’s redesigned offense on Sunday, getting all but one of the carries and finishing second in receiving. A 34-23 win at Indianapolis showed a different focus in coordinator Bill Lazor’s redesigned playbook. There’s a lot of Mixon in everything. The Bengals (1-0) wasted no time giving him the spotlight. He ran for 7 yards on their opening play, and either carried the ball or was the intended receiver on seven of their first 14 plays. He wound up carrying 17 times for 95 yards, a 5.6-yard average. Giovani Bernard got only one carry. Mixon also caught five passes for 54 yards, including a 21-yarder. Only A.J. Green had more catches. Mixon was on the field for 42 of Cincinnati’s 55 plays; Bernard was used only 14 times. Mixon’s 1-yard dive with 4:05 to play put the Bengals ahead to stay at 24-23. It’s the most significant difference from Mixon’s rookie season, when he shared time with Bernard and Jeremy Hill. Mixon got more carries later in the season when Hill got hurt. In the final game of the season, Mixon ran for 96 yards during a 31-27 win at Baltimore. The Ravens (1-0) visit Paul Brown Stadium on Thursday night, coming off a 47-3 win over Buffalo that featured three touchdown passes by Joe Flacco. Cincinnati finished last in the league in yards last season, and the running game was one of the worst in club history. A big part was the offensive line’s inability to open holes for running backs or give Dalton time to throw. The Bengals have four new starters on the line, which did better in Indianapolis. “They did a great job executing blocks,” Mixon said. Dalton seemed at ease with the redesigned offense, completing 21 of 28 passes for 243 yards and a pair of touchdowns. His passer rating was 109.7. Dalton’s only mistake was a floated screen pass to Mixon that was intercepted. “Andy played unbelievable,” Green said. The Bengals knew they’d face a public backlash when they drafted Mixon in the second round in 2017 even though he’d punched a woman in the face while at Oklahoma. They valued his ability to catch passes and break long runs, and were willing to take the criticism for drafting him. He’s emerged in his second season. Coach Marvin Lewis hopes he becomes a bigger part of the offense as the season goes along. Safety Shawn Williams was waiting Monday to see if he gets suspended for his hit on Andrew Luck that drew a 15-yard penalty and an ejection. Luck scrambled to get a first down and slid late. Williams hit him in the head with his shoulder, and there was helmet-to-helmet contact. Tight end Tyler Eifert got into the game for 22 plays and had three catches for 26 yards, including a 17-yard gain. Eifert played in the first two games last season before a back injury sidelined him and required surgery. The Bengals are easing him back in as a precaution. “This is as good as I’ve felt in a long time,” Eifert said. 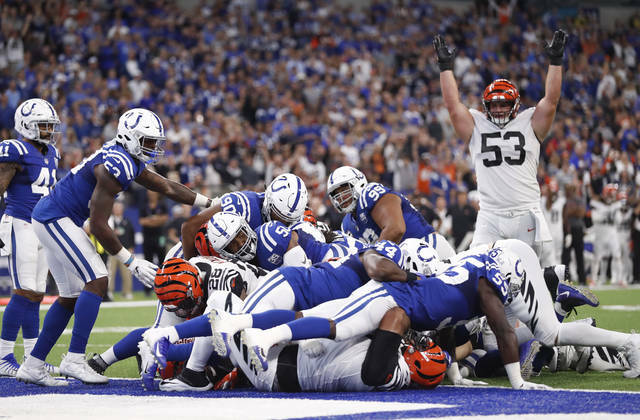 The Ravens opened last season with a 20-0 win at Paul Brown Stadium, the first time in their history that the Bengals were blanked in a season opener. Baltimore ended the season hosting the Bengals and got their final disappointment, losing 31-27 on Dalton’s 49-yard touchdown pass to Tyler Boyd with 44 seconds left. The loss eliminated Baltimore and put Buffalo in the playoffs.